Joy Behar shocked Americans as she and her co-hosts discussed how they feel about infants who are born alive after a botched abortion. When Behar and so-called attorney Sunny Hostin attempted to explain how it’s just a woman’s right, fireworks erupted on the set, and they got destroyed. You’ll love this. How does anyone explain supporting killing an infant? Well, that’s exactly what the Democrats are trying so hard to do, but they aren’t doing it well, judging by their mouthpieces on The View. Sen. Ben Sasse (R-Neb.) sponsored the bill which would have guaranteed medical care for all babies who survive a botched abortion attempt. It also would have threatened prison time for doctors who didn’t try to save the lives of babies born alive. The Senators who voted against the Born-Alive Act include 10 Senators who identify as Catholic. And just so you understand the leftist’s ridiculous argument to reject this bill ensuring infants lives after a botched abortion, here’s what an abortion provider said: “The bill maligns and vilifies providers and patients to push a false narrative about abortion later in pregnancy,” Dr. Kristyn Brandi, a board member of Physicians for Reproductive Health, told Vox in an email. Well, any doctor who fails to provide care to a newborn baby should see jail time. 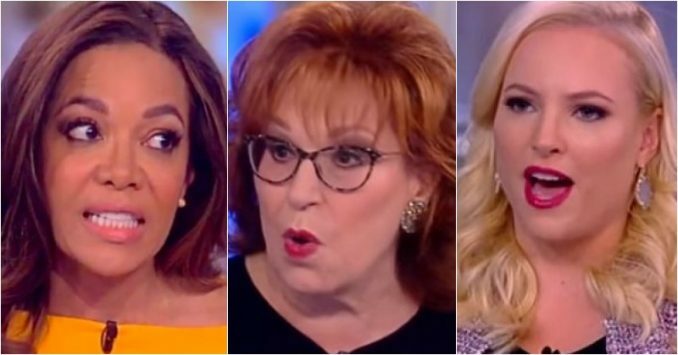 Which brings us to Joy Behar and Sunny Hostin who were shocked when Meghan McCain blasted them. While Ms. McCain has been siding with the Never Trumper crowd, we will give her a pass for destroying big mouth Behar and her arrogant side-kick Hostin. First, McCain blasted the Democratic senators, saying this was “an example” of “just how extreme the Left has gone.” And she was just getting started. “So if Democrats want to win an election going forward, are you going to be the party of late-term abortion? The party of infanticide?” an incensed McCain demanded, adding that “this is well out of the mainstream of where” Americans are. “And if you think that is how you win back the White House, I’m here to tell you: I spent a lot of time in red states. I’m from a red state. That is a losing argument,” McCain continued. “I thought you were pro-life like me?” McCain asked. Things became tense as McCain continually interrupted Hostin. “So you think a baby born from a botched abortion should be put down like a dog or a cat?” McCain demanded of Hostin. This spurred co-host big mouth Behar to attempt to wrest control of the conversation from McCain — and hand it over to Hostin. “Meghan, let her tell her story, please,” Behar asked. McCain, Hostin, and Behar all talked over one another at that point. “But she failed to note that many Democratic senators voted against the Born-Alive Abortion Survivors Protection Act because they claimed that keeping an already-born baby alive infringed upon women’s rights — as if this posed some kind of conflict,” reported LifeZette. And the Democrats have more bad news. According to a new Marist poll, Americans have shifted their views on abortion. Now, 80% of Americans support abortion being limited to the first three months of pregnancy. Politically, these Democrats are going to be burned come election time in 2020 for supporting what some people are calling infanticide. Well, Behar and Hostin failed miserably trying to explain away supporting murder. It just goes to show you that the Democratic Party is truly the party of evil and they have many minions who do support their diabolical plans. God help us as our country comes closer to looking more like Sodom and Gomorrah than Ronald Reagan’s shining city on the hill.